California’s Colorado River Water Use Plan (known colloquially as the 4.4 Plan) intends to wean the state from its reliance on the surplus flows from the river and return California to its annual 4.4 million acre-feet basic apportionment of the river. In the past, California has also used more than its basic apportionment. Consequently, the U.S. Department of Interior urged California to devise a plan to reduce its water consumption to its basic entitlement. The plan that emerged resembled a jigsaw puzzle of interlocking pieces that took almost a decade to put together and will require more than a decade to implement. 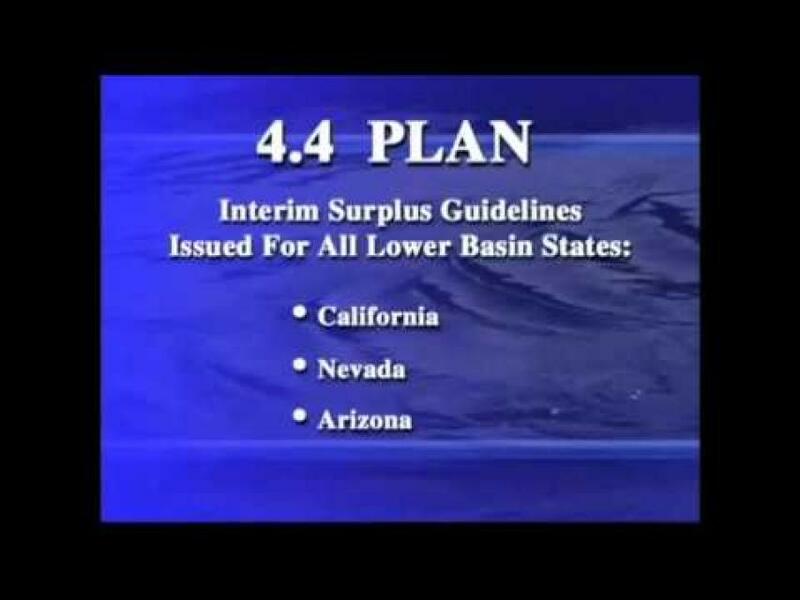 The basic plan was developed by the Colorado River Board of California, and is called California’s Water Use plan for the Colorado River (Water Use Plan), or more familiarly, the “4.4 Plan.” The proposal is intended to save up to 800,000 acre-feet of water through conservation and water transfers (agricultural to urban), canal seepage recovery, groundwater banking, conjunctive use, reoperation of Lake Mead (surplus determinations) and possibly desalination of drainage water. The puzzle pieces eventually fit together in 2003.The multibillion dollar pact “quantifies,” or allocates each California party’s share of Colorado River water, making possible water transfers among them, including a 35-year transfer (with potential extensions to 75 years) of water from the Imperial Irrigation District to the San Diego County Water Authority under the Quantification Settlement Agreement. Imperial County and others challenged the legality of the QSA in court but a Superior Court judge upheld the agreement in 2013. If the transfer lasts 75 years, SDCWA would pay an estimated $2 billion for water, which IID can use to modernize irrigation systems and mitigate economic impacts of the transfer. Fears about liability for environmental consequences in the Salton Sea scuttled an earlier version of the plan in late 2002. California has until 2016 to pare down its consumption of Colorado River water to its 4.4 million acre-feet annual allocation.